Fight like the sumo wrestlers in Japan! Whoever pushes their opponent out of the ring first, wins! 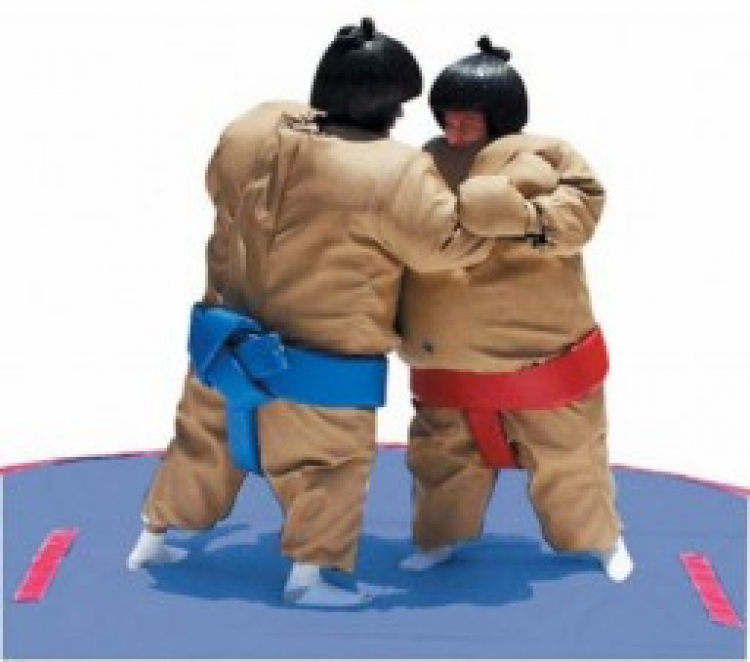 Includes 2 adult suits, hair helmets, mitts, & a sumo mat. The Sumo Mats are 14' X 14' in dimension & they come in 3 separate pieces that velcro connect together. The sumo suits fit 5’0 and taller for adults & at least 4' 6' and taller for kids or teens sizes. The Game: The suited players start by facing each other at the face off lines. The match begins on the referee’s signal. The first player is to muscle his opponent to the mat or to stepping outside the circle. It is important to prevent players from being knocked completely off the mat or falling backwards. For each player there must be a spotter.